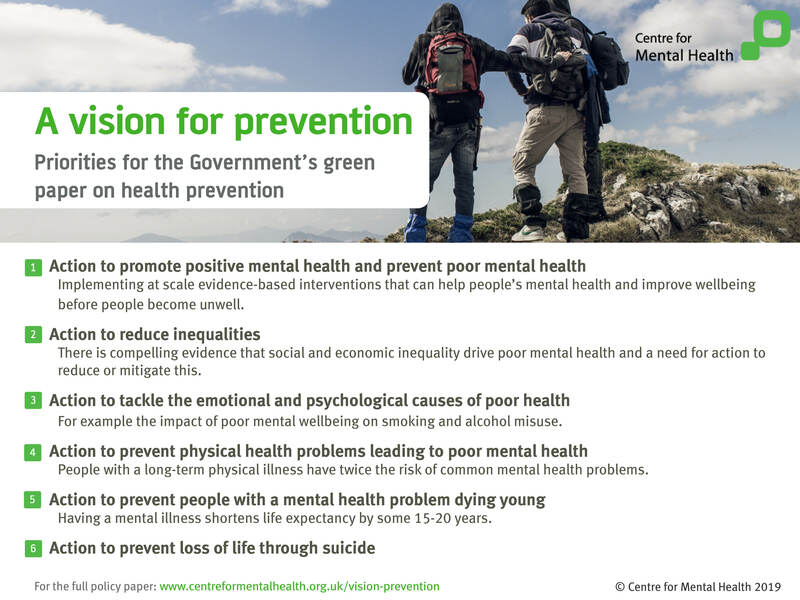 The Government’s green paper on prevention is an opportunity to bring about a marked change in the way we support people to have good mental and physical health and how our society’s injustices and inequalities are tackled. Action to promote positive mental health and prevent poor mental health: implementing at scale evidence-based interventions that can help people’s mental health and improve wellbeing before people become unwell. Action to reduce inequalities: there is compelling evidence that social and economic inequality drive poor mental health and a need for action to reduce or mitigate this. Action to tackle the emotional and psychological causes of poor health: for example the impact of poor mental wellbeing on smoking and alcohol misuse. Action to prevent physical health problems leading to poor mental health: people with a long-term physical illness have twice the risk of common mental health problems. Action to prevent people with a mental health problem dying young: having a mental illness shortens life expectancy by some 15-20 years. Action to prevent loss of life through suicide. Prevention is about more than changing individuals’ lifestyles. Effective prevention works in communities and across public services to create the right conditions for people to live well. With a concerted and robust approach to prevention across national and local government, we could transform people’s lives in a generation.